If you have been wet shaving for a while you have probably heard of or read about people shaving with the grain (WTG), across the grain (XTG), and against the grain (ATG) of their beard. Most people would assume that with the grain of your beard simply means shaving downwards, say from you side burns or your eyes towards your jawline. Unfortunately for many that is not always the case. Like the hair on our head, our beards grown in various directions, and the sooner you learn which directions your beard grows, the better your shaves will become. I let my beard grow for a few days so I could snap a photo showing the grain direction of my whiskers. If you click on the photo you can take a closer look. As you can see the hair on face doesn’t grow straight down, it varies direction. In fact it almost seems as though my hair grows in a slightly circular (clockwise) pattern from my side burn. So, when I shave (starting with the outside left of my face) with the grain I actually try to run my razor from ear down and slightly in the direction of my chin. By the time I get to my cheek I am shaving I am almost shaving from my nose towards the back of my jaw. The front part of my jaw I shave from chin to ear. The center part of my neck is up and toward my nose, while the side part is almost straight up. My chin is a mess of direction so I just change direction with each pass. If you are wondering why on earth you would take the time, or even care about mapping your beard, it is because shaving with the grain (WTG) of your beard will produce much less irritation than shaving across the grain (XTG) or against the grain (ATG). If you only plan an shaving with the grain this is key, but it is also important that your initial with the grain pass removes the majority of your facial hair so when you move on to your final two or three (or four) passes you are refining you shaving rather than mowing through. If you decide to map your beard there are a couple of things you could do to help you out. First of all you need some facial hair, so I would let it grow for a day or two. You could take a picture like I did and try to visually figure out the direction of you facial hair. 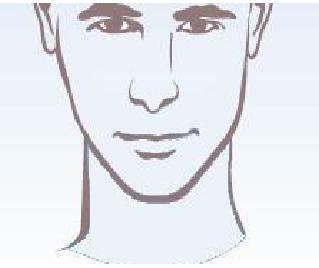 You could also print out a facial diagram like this one and pencil in the direction. Or you could use this interactive template to help you with your grain (the image below is a quick mapping of my beard that I produced with the interactive template). Just run your fingers along your face to determine the direction. You are looking for the opposite direction of your smoothest pass. In the end you are looking for the best and most comfortable shave you can get. So do what works best for you. If against the grain is best for you then knock yourself out. But it can’t hurt to try mapping your beard to see if you get a better result.